Obama has no plan to address our $14.3-trillion debt; he cannot be trusted to manipulate the economy and our energy supply; and his plans make no sense, Governor Palin said tonight in a two-segment interview with Sean Hannity from her home studio in Wasilla, Alaska. Our triple-A rating with Moody’s is under review, because Obama has no plan to address the debt which continues to climb, she said. Gov. 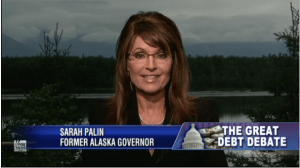 Palin said proposals to hand-over more power violate Article I, Section8 of the Constitution. Congress should make the economic decisions, she said. “The numbers speak for themselves. We cannot trust him to manipulate the economy and energy supply. She mentioned QE2 with the possibility of QE3 and even QE4. Both Hannity and Gov. Palin indicated that our daily revenue is sufficient to pay the interest on our debt, Social Security, the military and some other essentials. The non-essentials are what need to be cut. Gov. Palin said though she is against raising the debt ceiling, she knows it will be raised. “I would not vote to incur more debt – not under this President. I don’t trust him,” she said. Gov. Palin added that she would support Jim DeMint’s plan to “cut, cap, and balance.” She is against “dollar-for-dollar” debt increase and spending cut proposals because there is no way to guarantee that the needed cuts would be made. “He does not know how to make cuts. He never had to use executive authority,” Gov. Palin said. The interview shifted to the Newsweek article, which Gov. Palin said was fair. “Boyer…wanted to talk about a successful executive who was pro-jobs, pro-private sector, and pro-energy independence,” she said. Can She Win the White House? retrieved from Fox News. Listen to Patrick’s World USA BlogTalk Radio show tonight at 11:00 pm E.T. 8:00 P.T. The Transcript of tonight’s show will be posted here right around show time. You will want to listen and pass it on to everyone you can. Think of it as a Mr. L’s Tavern without the video.